Not quite black and white. While the overall look of the game is very close on both machines, the Xbox 360 version wins out with the inclusion of a bit more bling for your money. The most dramatic example of this kicks in on the third chapter, which takes place on a series of small islands in the middle of marshland. As you might expect, the water is a key element of this particular stage and you'll note that the PS3 version of Resident Evil 5 is flatter and duller, with fewer reflections. The Xbox 360 version on the hand has full world reflections, making this stage in particular rather more attractive than its counterpart on the Sony platform. It's a similar compromise to that seen on the PS3 version of Fallout 3, where once again 360 has more detailed and realistic water reflections. Also evident is that the Xbox 360 version has more in the way of incidental particle effects and transparent alpha textures (i.e. smoke). For example, in the main video edit you saw how Chris Redfield takes down a speeding lorry that's hurtling towards him. On 360, there are friction-esque sparks and a proper exploding windscreen that you don't see on PS3. None of these make the Sony platform look that much inferior in the heat of the action, but it's a clear indication that Capcom still has some work to do on the Framework engine to bring its performance up to the 360 counterpart. However, what is far more noticeable and with significance for the game's playability is the difference in the refresh rate. Capcom has taken two entirely different approaches to the frame rate on both platforms with Resident Evil 5. Contrary to early interviews with Capcom, the game isn't running at 60fps, instead operating at the more usual 30fps, albeit with some frame-blending in effect to make it look perceptually smoother. Overall, this effect works well. The major difference is that Xbox 360 runs with v-lock disengaged, while the PlayStation 3 code has absolutely no tearing whatsoever. However, similar to Grand Theft Auto IV - which operates in the same way - the Xbox 360 version has a tangible advantage here on two fronts. Firstly, it drops far fewer frames than the PS3 code, and secondly, the response from the controls is significantly crisper, particularly when the environments are chockfull of opponents. And again, similar to GTAIV, while the tearing is there, it's pretty much unnoticeable in gameplay (cut-scenes are another matter). To give some idea of the difference in performance, here's a frame rate analysis video comparing two scenes from the game from the first and second chapters respectively, followed by a more lengthy QTE section (essentially a cut-scene with the occasional button-press). The numbers at the top are fairly self-explanatory, as are the graphs - both being averages of a set number of frames. Where you see a green vertical line, that's an indication of a torn frame on the 360 version. A blue line would indicate the same thing on the PS3 build, but you won't see any of those here due to the v-lock. Overall gameplay impressions back up what you see on the video. The Xbox 360 game has the odd bit of screen tear, but its impact on the image quality is not a big deal, and more importantly, it makes for a smoother, more playable game. Where you'll see the tearing most evident is in the cut-scenes. 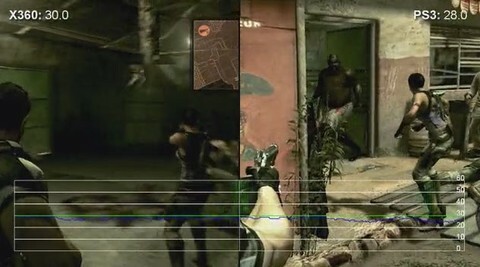 The potential on the Framework MT engine is best expressed by Resident Evil 5's cut-scenes. Aside from the intro movie, every single cinematic in the game is fully rendered by the game itself in real time. Here, where Capcom has full control of the camera, we see effects being manually turned on and off and tweaked according to the director's taste. 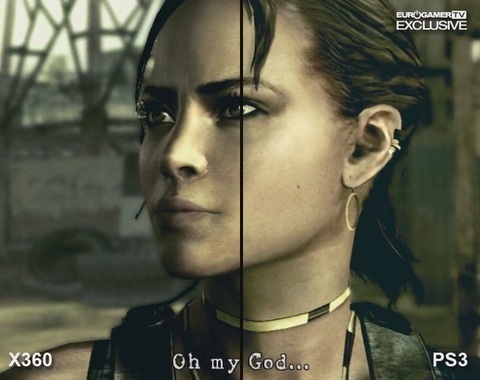 Chris, Sheva, and the other main characters are displayed with greater detail (higher-polygon 3D models, definitely on facial features) and more effects - different shadowing models are used according to the effect the director is going for, and also with an eye on performance. Superior depth-of-field effects are in evidence, along with additional post-processing parses such as a noise filter. It's quite amazing to think that the same engine is capable of visuals that are so much better than the in-game graphics. It seems to be the case that three detail levels are available to Capcom - close-ups on the characters see the introduction of more detailed models with additional animation points. There's a 'mid-way' detail level with less complex animation and shadow effects and finally there's the usual game engine setting. The 360's screen-tear is at its most noticeable here, as you might expect from an engine that is being stressed to its limits. PS3 works better as a result - dropped frames aren't so noticeable when you're not in control, and the rock solid v-lock means a more coherent image. Why concentrate on the cinematics? A couple of reasons: firstly you get to see what Capcom's engine is capable of in strictly controlled conditions (a vast series of tech demos if you will) but more than that, there is an assumption here that greater GPU power and memory in the next console generation should allow for this level of visual fidelity to be run in gameplay, probably at 1080p too. Now that's something to look forward to. As mentioned in Kristan's review, the online component of Resident Evil is absolutely crucial to getting the most enjoyment out of the game. Indeed, it has to be said that playing it through in the single-player mode (as I did for the most part in order to get synchronised video) is often a little on the dull side. The good news here is that both games work exactly as they should, and boast much the same feature-set. Capcom has already patched the 360 version's Mercenaries mode to support online co-op and I strongly suspect that the PS3 version will be following suit imminently. And so we come to the absolute crux of the issue here if you're fortunate enough to own both machines: which release to buy if you own both systems. Game content is identical on both machines, and while PS3 owners still get a decent enough version, it's the Xbox 360 rendition that is clearly the more attractive, solid and more playable game. However, the fun of the co-op mode is orders of magnitude more important than the differences between the two conversions, so the core issue comes down to which set of online buddies you want to be playing this game with. Spend more time on PSN? Go for PS3. Got a whopping great Xbox Live friends list? Buy that one and consider the better visuals and smoother gameplay a nice Brucie-bonus. In terms of just why Xbox 360 has the edge technically, it seems to be all come down to the set-up of the graphics hardware. Capcom itself rates the triple-core Xenon CPU as being about equal to a dual-core 3.2GHz Pentium 4 Extreme Edition CPU. Not a bad processor as such, but no match for the raw computational power of Cell. However, Capcom has made extensive use of the 10MB of 'EDRAM' that is directly attached to the Xenos GPU in order to maximise its visual effects. With virtually unlimited bandwidth, effects can be processed enormously quickly. The Cell/RSX combo doesn't this advantage, although ironically, the PS2's graphics synthesiser does - one of the reasons why full software emulation of the older console is difficult on the PlayStation 3. What is clear is that while first-party developers are pushing the Sony hardware to new graphical heights for this generation, third-party multi-format game-makers are still having issues replicating Xbox 360 performance. That we should see this from a developer as accomplished as Capcom, whose home market sales are so reliant on PS3, is both surprising and a touch disappointing. Resident Evil 5 is due out for PS3 and Xbox 360 on 13th March. Check out our full review elsewhere on the site.